For obvious reasons, we chose not to celebrate yesterday’s holiday. But today cannot be ignored. Today we pay honor to all those who have been lost in action. Today is Lost Sock Memorial Day. Socks are ignored, unappreciated, and taken for granted. They are walked on day after day. And yet, we only take notice when they disappear. So, let’s all take a moment of silence to show respect for both those we’ve lost and those that have been left behind. 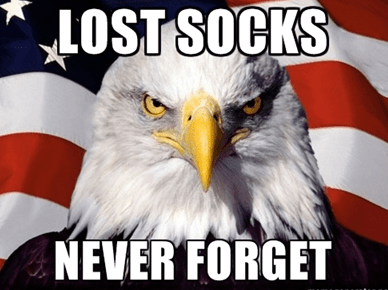 Most people are surprised to learn that the Bureau of Missing Socks began as a company in the Union Army during the Civil War in the States of America. It was formed on August 1st, 1861. The name of the founder was Joseph Smithson and he was a haberdasher by trade but quite a bad soldier. He was therefore put in full and complete charge of socks of the enlisted men and officers. Heavy.com also provides “5 Fast Facts You Need to Know” about Lost Sock Memorial Day. Thank you, socks, for all that you do! We’ll never forget.